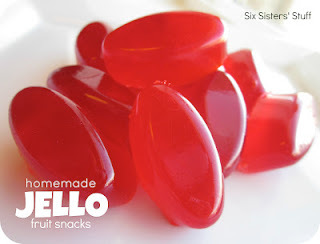 This recipe uses gelatin and the texture ends up like fruit snacks. No, they don't need to be refrigerated! • Sprinkle the gelatin over the water in a small saucepan. • Heat over medium heat, and stir until gelatin is completely dissolved. • Pour into molds, filling them up about 2/3 of the way full. • Allow to set at least 20 minutes. • It makes about 20 large fruit snacks. Ellen Kessler posted: No thanks. Gelatin is not vegan. So I looked it up and there are a number of vegetarian-appropriate setting agents on the market — Among them agar-agar (powder, strips, or flakes from a sea vegetable), arrowroot (a starchy powder from the tropical tuber of the same name), guar gum (the product of East Indian seed), Xanthan gum (a corn extract), kudzu (a starchy powder from the plant's tuber), and certain ground nuts and seeds. Most (but not all) kosher gelatins are also vegetarian. Some of these are available in supermarkets, others require a trip to the health food store. If anyone tries these alternatives, let us know how it works out! Holly Ludwig posted: Wish I'd known about this when my son was small. These molds are super cute too! Maybe one day I'll be blessed with a grandchild. Alisha Tebbets posted: Knox blox!!! Been eating these since I was a kid!! Soooo good! Ann-Louise Harris posted: I made these the other day, DELICIOUS! but, I would spray a little 'Pam' to help the snacks release from the mold. I was using the Jello Bean molds. Thanks for this awesome recipe. I am going to test it out this coming weekend.